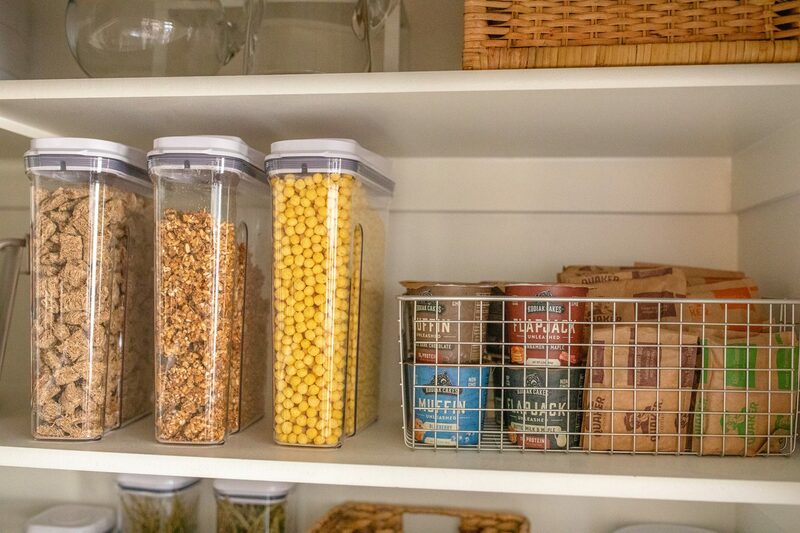 Nothing sparks joy quite like an organized pantry. Like many of you out there, we find that our pantry is the first place to get messy, cluttered, and filled with food that we end up forgetting about. We think of it as the black hole of the kitchen. Additionally, the pantry is often the temptress of unhealthy food choices. 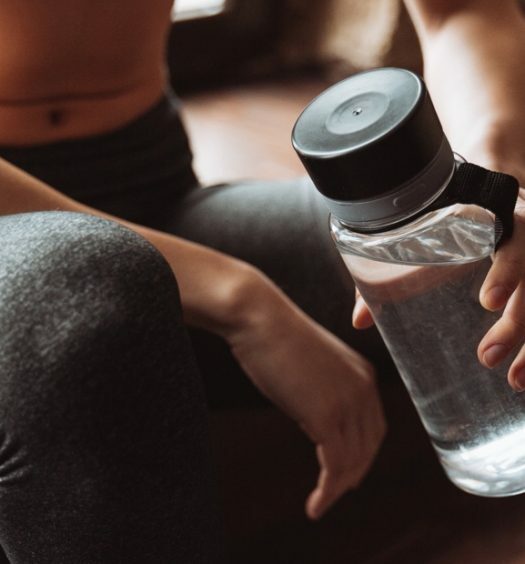 The cookies, leftover Easter candy, and other occasional indulgences are definitely not the most nutritionally sound food choices. 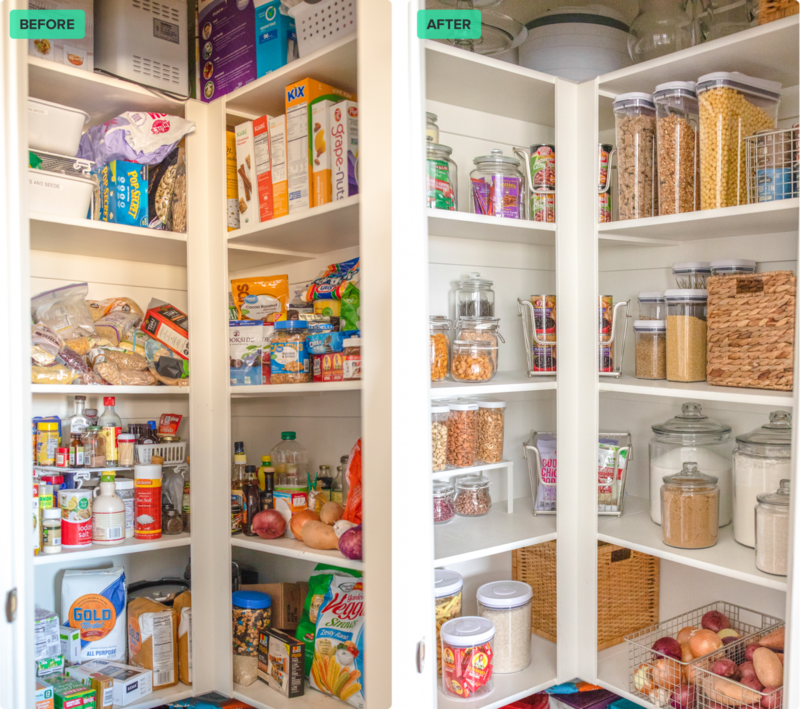 We’ve found that proper pantry organization is not only visually appealing, but can also lead to healthier food choices. Here are some of our favorite tips for a beautiful and functional pantry. Love our look? Here is a list of the items we used to organize, as well as some additional iFit favorites. We also found a lot of great organization solutions at Ikea (linked throughout) that we incorporated in our pantry. Citrus: Store lemons, limes, grapefruit, and oranges in your pantry, not your fridge. Place them in net fruit bags to ensure they won’t be forgotten! Potatoes and tomatoes: Store in a dark, cool part of your pantry, not your fridge where they can easily be seen, so you use them before they go bad. Rice, beans, and nuts: Transfer dry foods such as rice, beans, and nuts into clear, airtight containers. This will prolong the life of your food and allow you to see what you have (so you prevent repurchasing the same items). 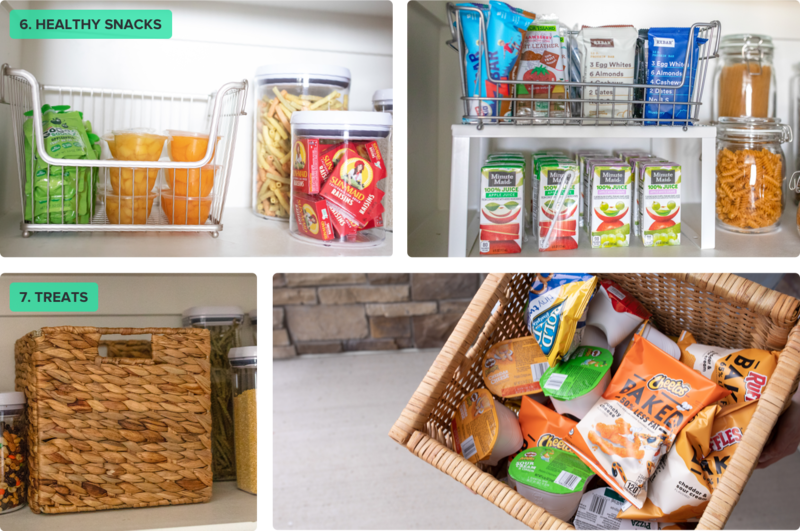 Staples: Store pantry staples (check out our pantry staples here) in clear bins. That way, you can see what you have and maximize storage. Now that you have a thorough understanding of how to properly store your food, let’s talk about organization strategies that lead to good health. We still want you to have the indulgent treats you enjoy…we just want to make sure that you are grabbing healthier snacks more often! 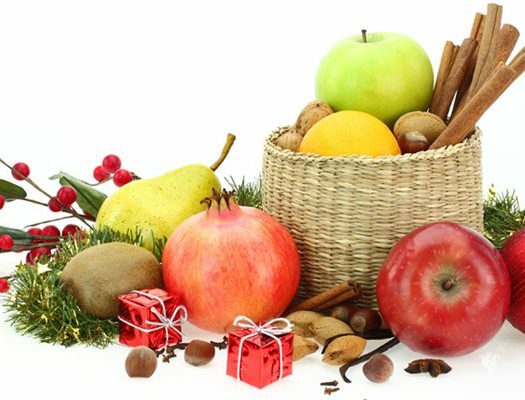 Healthy snacks: Place easy-to-grab snacks on the top and middle shelves in your pantry, so they are the first things you see. Some good options are nuts, seeds, whole grain crackers, dried fruits, rice cakes, roasted seaweed snacks, and popcorn. Treats: Place treats high up in your pantry in solid containers or wicker baskets, so they aren’t the first thing that you see. Check the clear containers of grains, dry beans, and canned goods at the beginning of each week as a reminder of what you already have on hand. This is a great way to plan meals for the rest week without having to buy a ton of groceries. Delegate a basket for half-eaten snacks. Eliminate the need to “finish the bag” by tapping into your hunger cues. When you’re full, placed the unfinished snack in a basket. Then, if you are in the mood for something small later on in the day, you can finish them. This is also a great way to reduce food waste! 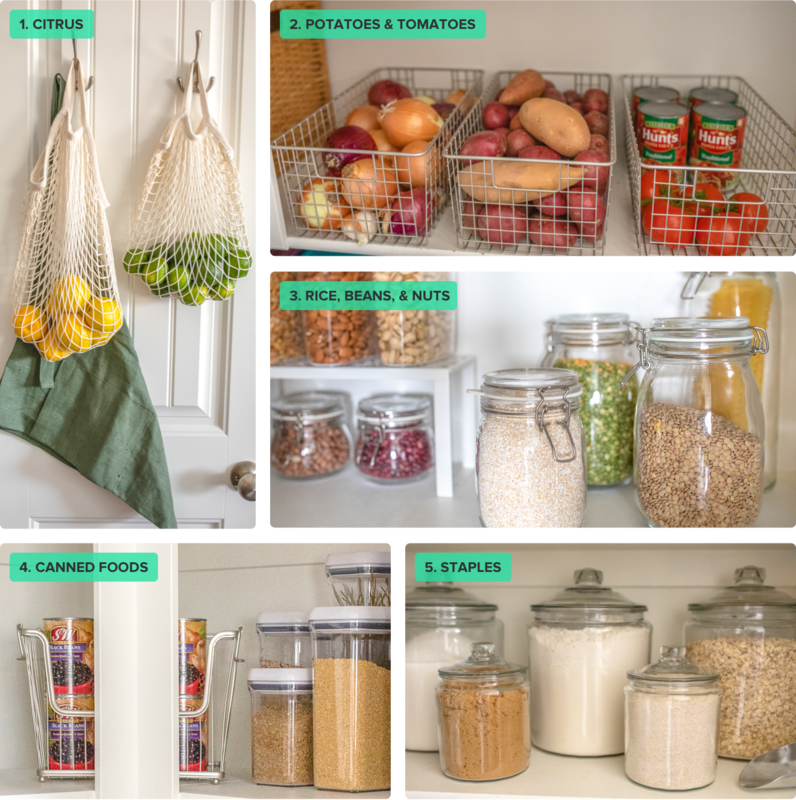 We hope these storage and organization tips inspire you to turn your pantry into something a professional organizer would be proud of. Not only will you feel accomplished and less weighed down by the random and unnecessary stuff that might be cluttering your pantry, but you will be setting yourself up for healthy eating success! If you’d like to learn about proper refrigerator storage and organization, be sure to check out our blog post here.